This is the new Arduino Uno R3. In addition to all the features of the previous board, the Uno now uses an ATmega16U2 instead of the 8U2 found on the Uno (or the FTDI found on previous generations). This allows for faster transfer rates and more memory. No drivers needed for Linux or Mac (inf file for Windows is needed and included in the Arduino IDE), and the ability to have the Uno show up as a keyboard, mouse, joystick, etc. Never fear for accidental electrical discharge, either since since the Uno R3 also includes a plastic base plate to protect it! This is just the board, it does not come with a power cord or a USB cable. Check the recommended products if you need either. That's the SMB version. So this is the specifically DIP board. Question: the picture shows the board having a removable DIP package, not a SMD package like your RedBoard has. If I purchase this board, will I be guaranteed to receive the DIP package model and not the SMD package? Reason I ask is that I recently purchased an UNO from Maker's Shed that showed a DIP, and wound up getting a "special edition" SMD board, not what I wanted (though I'll take, can't have too many Arduino boards... :) ). But I'm specifically wanting a DIP package board, not an SMD package board. Thanks! Yup - this is the DIP package version. We separate out the SMD version to its own product page here. Does it come with arduino board? Please note that purchasing this board does not support Arduino.cc, the company that designs the Arduino and maintains the software. All purchases of this board support Arduino SRL which has stopped making royalty payments to the original Arduino project (see https://www.sparkfun.com/news/1791). SparkFun currently pays royalties on the official Arduino boards we make, this includes the Pro, Pro Minis, Fio, Lilypad, and Lilypad USB. We also have quite a few boards we make that are not official Arduino boards and therefor do not have royalties associated with them like the Pro Micro, Fio V3, SamD21 boards, Qduino board, and the Uno compatible Redboard (in some cases we offered to pay royalties and the offer was declined). Definitely check out the article listed in the comment above for more information. It might be good to note all the changes in this board from Rev. 2. The added pins are a pretty huge change - Future shields which use these pins won't be compatible with existing Arduinos. The male pins on the shield above 'reset' (which is currently on a 6-pin header) would interfere with the bulk power supply caps. According to the images, untented vias (or at least the annular ring is uncovered) on the top side, making it slightly easier to solder wires to the PCB or short something out. An unknown component near the ICSP header - I'm guessing a diode - on the reset line? The schematic doesn't show it, there's no reference designator, and the "Eagle Files" .zip file is empty/corrupted (144 bytes means it's really compressed). Which reminds me: Your "Eagle files" .zip file is corrupted. Also, I couldn't get schematic diffs because your previous version pages don't host the documentation, they point to the product pages on Arduino.cc, which have been updated. Could you find a little space on the Sparkfun servers to host those old revs? One could easily trim those pins off. It's crude, but fixes the problem. Definitely an excellent, well thought out improvement. I don't see any unmasked vias. That's most likely an ESD protecting diode running from reset to 5V. 6 An unknown component near the ICSP header â Iâm guessing a diode â on the reset line? My quess it's a zener to improve the reset circuit. Note: This information was not on the earlier schematics! on Linux, Mac, or in Cygwin, but this still results in a broken board file. Credit goes to Majenko (http://hacking.majenko.co.uk/) for the discovery; bump the thread on the forum (http://arduino.cc/forum/index.php/topic,80733.msg610998.html#new) to help promote it. I doubt it. If they did, everyone would clamor for the ATmega32U2 as well as the TQFP version. Sparkfun is a vendor of hard-to-find components to low-volume hobbyists, not an electronics distributor. If you want the ATmega16U2, use a distributor like Digikey or Mouser; it looks like several places have both the ATmega8/16/32U2 in stock in both the TQFP and VQFN packages (you want the latter for the Arduinos). They're about $4 in singles. Remember, you'll need an intact Arduino or ICSP programmer to flash the Arduino code into the U2. Es un muy buena plataforma. Hay una gran comunidad alrededor. La recomiendo especialmente para personas con pocos o nulos conocimientos en la electronica. Aunque para profesionales tambien es muy util. Creo que Arduino trajo mucha gente con muchas ideas a la comunidad electronica. se lleno de proyectos simples e interesantes. Ugh, less than a month since I ordered my first Uno and now a new revision comes out. How are you liking it so far? I know you didn't get R3 but do you still like it? Are you new to microcontrollers? We do ship to Peru. Shipping depends a lot on the method you choose as well as you exact address. The best way to determine shipping is to add the item to your cart and try to check out. The first part of the checkout procedure gives you a list of all shipping options as well as their prices. Note: This does not include any import fees that your country may charge. The Arduino Uno R3 is a great little board. The only problem is that it doesn't have enough memory for really big programs with a lot of variables. Are there any ways around the memory problem, other than using less variables? There is always just being a more efficient programmer (better use of functions, pointers, variable, etc.). You can also be creative and use an SD card for things like data, this works well if you are doing things like playing music where half you code is actually keeping track of your notes. You can also split your code onto 2 boards (a lot of people do this with the Pro Minis) and have one do data retrieval and the other number crunching or something. If you still don't have enough memory look into the Arduino Mega if you want to stay with Arduino, Teensy boards if you kind of want to stay with Arduino, or pretty much any ARM board if you are up for something different. Nice, but this could be cheaper. SainSmart has a UNO R3 compatible board, with extra headers for all I/O, PLUS 3v3V/5V I/O switch, for almost half the price: USD 13.99. So it's possible (esp. since you mention you make purchases of 10k). Except this isn't an Uno R3 compatible board. It is the official Uno R3 meaning 1. We don't really determine the prices 2. This product officially supports the Arduino environment and IDE. Everyone makes clones, and can often make them cheaper (especially if they are in China and/or do not support our friends at Arduino). We even make our own clone, but you will always pay more for the original than for a clone. Is that a firewire port on the Arduino Uno - R3 and if so dose it come with a Firewire to USB cable? Would this be the best board for a 5x5x5 LED cud, if not what is the best arduino board for this project? Definitely not a firewire port. The Uno has a USB port (B type, same as most printers), and a barrel jack connector if you want to power it that way. Otherwise just headers to connect to the pins. Great Board and have it working brilliantly with bluetooth shield. Question, what is your recommendation for rechargeable battery power? The Arduino needs 7-12 volts so was thinking 2 x LiPo @ 3.7V each and Sparkfun LiPo USB charger??? Hi! Does it come together with the USB cable?? No, we do sell the USB cable if you don't have one, but the board does not come with one. Hello, I want to use this board to digitize some analog signal that varies +/-10 mV level. Is this board able to provide enough precision with its 10 bit quantization? Thanks! ,i have an arduino + lcd keypad and i want to put a function in a case menu but i dont know how .th function must count how many times i push a button in a period of time.i use pin 2 and 3 for buton.if somebody can help me with the cod. I just noticed that Mouser now has the Arduino Uno R3 for $24.51. copper lettering under soldermask on bottom - by usb  on one and  on the other - panel locations? female header pins are labeled - Lovely! why buy the SMD verses the DIP model? I don't know! I have nearly worn out my DIP socket from using the UNO to program 328s for embedded and from removing the 328 to use UNO as a serial programmer. try that with the SMD. ;) On my original, I will replace the DIP socket with a ZIF socket. Shields won't fit, but I have other R3s. I'd like to see a new Arduino with a built in compiler. Add a switch that makes show up as mass storage device when plugged in, with the code the as the only .txt file. Then you could reprogram it from any computer without any extra software! Not a good idea to sacrifice precious Flash space to put a compiler you'll never use again when your code is final. Besides, the compiler wouldn't even fit in the available Flash space. do you do shipping to malaysia? I would think they would, but I don't work at SFE, so I don't know. We do! Check for more info here. Hi, does this come with the 5v power supply wall adaptor? "and the ability to have the Uno show up as a keyboard, mouse, joystick, etc." How does that feature work? I thought that was only on the Leonardo. Hi! I'm just bought an UNO R3 and start playing with some MCU applications. At first, I want to start with creating some shields which would be handy. So, I begin my work with the Eagle files here i.e. deleting all the components and leaving the connectors intact However, the Eagle schematic and board files here are not consistent by default. Many components are from smartPrj.lib something that can't be referenced to. How should I fix this consistency error? or where to find that smartPrj.lib? I've done some Googling but none works. Thanks! The easiest way to resolve [the consistency error] is to open the .brd file in a text editor (notepad will do), look for the text "1x10@1" and replace it with "1x10". There should be two occurrences, replace both. The files should then load without a consistency error. does this include the usb cable? nope, just the board. check below for USB cables, or search around your house, most people already have a few. I visited the manufacturer's site, and find that all the required software and documentation for the Uno are scattered around on various web pages. Is there perhaps a single place where I can download everything at once? In particular I would like an off-line source of documentation, rather than having to access it a page at a time on the internet. The software for interfacing with the Arduino is available here and includes several great examples in the download package to get you started. If you are looking for a general all-in-one getting started guide, you may want to check out the download for our SparkFun Inventors Kit guidebook, or look at a book like Getting Started with Arduino. You should really check with Microelectronica for support of their boards, but from looking at the site, it looks like it depends on the individual click board. The main thing you need to keep your eyes open for is that voltage levels match up, and checking pin outs if you want to be able to plug them together. Otherwise you may just need to use jumper wires. From that link, it is indicated that Arduino started using their own USB vendor ID (VID), so the device will not be identified as nor work with anything related to FTDI. 64-bit Windows has been a lot more picky about unsigned USB drivers than prior versions. While I haven't done anything with Arduino yet, there are a few things I can suggest. Historically, when you disable the driver signature enforcement, Windows re-enables it on the next reboot. Not a great or permanent solution, but if you're just trying to get something done, it may be an option. 2) Try to coerce Windows into loading the driver. If you go into the device manager and tell it to load the driver, it may force you to browse to the location of the .inf file with the Arduino VID/PID (probably provided with whatever you installed for the kit). It may then allow you to use this if you suffer through enough warning dialogs first. This may work better under 32-bit than 64-bit (where I believe the enforcement is more severe). This might need to be done in conjunction with option #1 above. 3) Windows is the only OS that requires a special driver file to use the new board (notwithstanding reports of OSX Mountain Lion above -- not sure about that). You might be able to get an Ubuntu Linux on a USB flash drive that allows you to use the same tools without installing anything permanently on your PC. However, that is likely to have its own learning curve. 4) Buy a USB Vendor ID for yourself ($5K), get the device driver professionally tested (~$400 just for Windows 8 64-bit based on my experience) and signed ($250). This is what Microsoft thinks you should do. I think that some combination of #1 and #2 will get you past this. Can this control 5 servomotors? If so? How do you connect them? You can control up to 12 servos on the Uno using the Servo library. Keep in mind though that you will need a separate power supply to drive the servos, as the Uno cannot provide that much current. 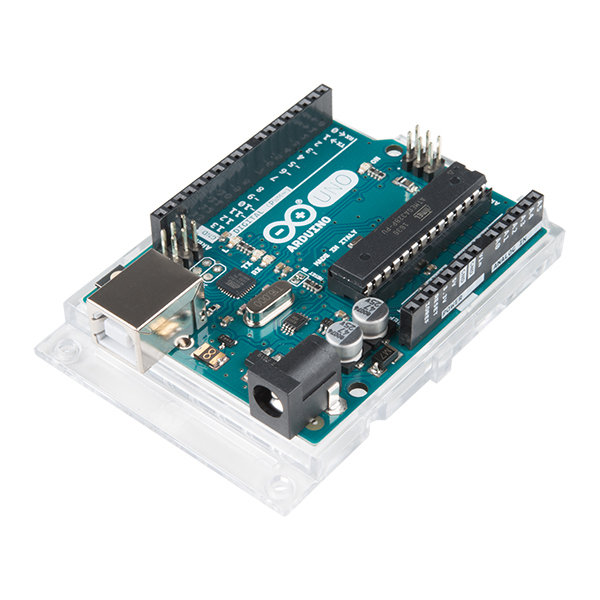 Hi I would like to know if it is possible to connect a Proximity Sensor(Sharp GP2Y0A21YK IR or Maxbotix LV-EZ0) and a Arduino Wi-Fi Shield(DEV-11287) both in a Arduino R3 ? The sensor in the Arduino R3 and also the Wifi shield. The Uno isnt showing the correct serial ports on Mountain Lion for Mac, what do I need to do to get the correct ports to show up? When setting it up for Mountain Lion on Mac no serial ports besides bluetooth ports showed up. What do I need to do to get the appropriate serial ports to show up? Just wondering: will the Uno be phased out in favour of the leonardo? I doubt it. The Leo is only available in SMD. People like me enjoy being able to pull the chip if needed/wanted. Can I power this with an 18V drill battery? if not what would I need to do so? The higher the input voltage, the more power is lost in the voltage regulator, the hotter it gets, and the more the available current will be limited. Ideally, you want to keep your power supply between 7-12v to prevent any damage to the board. The max rating for the Uno is 20v, but again, you want to stay away from this. Voltage regulation is going to be the key otherwise. Hello! Is there any way that i can program a 93C46 ATMEL through an Arduino board? Do I still need the FTDI cable/breakout board to upload a sketch? I did the breadboard version with no usb connection but could only upload via ICSP. Got my answer when my new R3 Arduino(Delivered in 2 days standard from sparkfun!) was first powered up giving me the usb to serial port, flashed the Ping example and had no issues at all. Does anybody have the brd for this that can be opened with Eagle v5.11? I can't upgrade to Eagle 6.0 yet. Anything specific you need it for? Exporting from v6 (export-board.ulp) and trying to get it into v5 seemed less than satisfactory. Oh, that's a thought... could you export a DXF? I need to incorporate all the features (board edges, mounting holes, pin locations) into a mechanical assembly. It would be nice to actually use the *.brd file, but for now, I just need mechanical features. An Eagle BRD file is more problematic. The board export ULP is a little twitchy as it is, and of course doesn't export package information - so v5 complains and doesn't place any pads. exp-project-lbr.ulp generates a library that v5 refuses to load, etc. Thanks, Kamiquasi! That works perfectly. Yeah, I think it's time to upgrade, as we're getting a lot more use out of Eagle these days. Thanks again for your help. One more trick for you: EAGLE 6 files are now XML format text files (a good reason for upgrading) that are quite human-readable. If for example you just need the locations of the standoffs, you can probably find the parts and coordinates fairly easily in the .brd file itself. Also, if you're not updating because you don't want to affect an older paid installation, you can install the free version alongside the paid one without causing problems. Yeah, but you'd probably want to write a proper parser for the rest :) Coordinates for package footprints are all relative to a master definition of that package, for example. Upgrading, even if it's just grabbing the free copy, is definitely the path of least resistance. Hi, I am new to arduino, Can any one tell me how to make Arduino Uno to communicate with Android device. I considered of having a ADK board from seeedstudio.com, since it costs more I am looking for other options. Please help out.. I'd suggest using the IOIO board for any Android related development. It is much easier to use than the ADK, i.e. you only program in one environment and the code libraries you use are based on the Arduino template of writing code: setup and loop. Check the IOIO wiki here for more info. Thank you very much for the reply. Since we are planning to release that as a product, we are planning to develop our own board. So we cannot use any standard available boards. So we were looking for the alternatives. And found out Uno can complete the required task. Actually there will be different sensors(fire,smoke,door,PIR) attached to Uno, and if any of them is triggered particular action is taken via the android device. 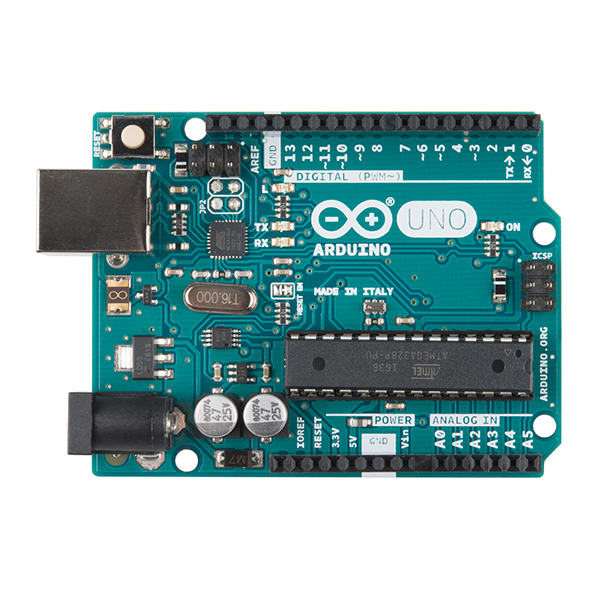 What is the official pronunciation for Arduino UNO? I have heard Arduino said many different ways. Is UNO said U - N - O or UNO? To the best of my knowledge, it's the Italian and Spanish word for "one", and not an acronym. We pronounce it "oo-know" around here all the time. Mike's right on this one! The naming convention probably came from the fact that this board was released in 2011. The previous version, the duemilanove (translation from Italian is 2009), was released in 2009. Why they didn't go with undici (11) is beyond me. 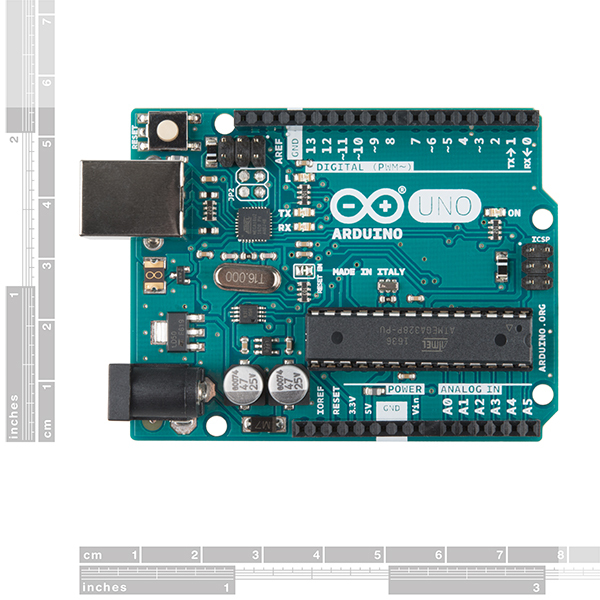 FYI: According to Arduino's website, it was named "UNO" to mark the release of the Arduino 1.0 IDE and is Italian for "one" (Arduino roots are from Italy). Just a word of warning: the eagle files provided appear to be made in EAGLE 6, so any lower versions appear not to be able to open them. Also: when I recieved mine, the top 10 pin header was shifted up by one pin, making it impossible to install a shield. Easy enough to fix, and I don't blame QC for it: it was a very well hidden problem. The PnP that installed the headers probably just miss-alligned it when it inserted it. Sorry to hear about this error! Good to hear you were able to fix it though. If you ever have that problem again, please feel free to contact us at techsupport at sparkfun dot com. Question, since I am not familiar with the arduino at all. Is the atmega dip preloaded with snything or can I just put in another atmega if I want to? The ATMega comes with the Uno bootloader pre-installed on it. You could switch it out with a different ATmega chip, but the Uno will then not function in the same manner. I'm looking at mating one of these to a GainSpan GS1011MIE, but the documentation seems vague and I'm not sure how they'd hook together. Has anyone done it, and how did it go? Are there other (clearer) options for getting an arduino to do 802.11 wifi? (I need range and reliability but not speed). Thanks! Note that this item does not come with the USB A to B cable. Search for CAB-00512(also in the related items) if you require the cable as well. It uses an ATmega328 AND an ATmega16U2. The 328 is for the main microcontroller and the other is for the USB interface. I'm considering buying one of these, developing software, and then prying the processor out and putting it on a (very space-constrained) circuit board. What's putting me off is the hate-mail at http://www.sparkfun.com/products/10524 - it sounds like the chip isn't all that stable about booting when its on its own. Also, there's no 16MHz crystal currently available for this processor here, which makes me wonder if this chip is sort of being abandoned, because it was a troublemaker. Can someone comment on stability and long term viability? This is a one-off project, but it has to be rock solid about booting up when power is applied. And I'm not one for patiently fussing with bootloaders and .hex files - I want to write C++ code, push a button, and see it running on the chip, 10 times out of 10. Am I better off with something else? Iâve got a RGB LED lighting project Iâm doing for a friend. This project involves the interior illumination of a show car (68 Tempest) with specific colors to compliment the interior color scheme. Cascade two previously selected colors around a loop consisting of daisy-chained digital RGB LED strips (probably two). I demonstrated to him how I had used an Arduino Uno R3 to program a BlinkM which in turn was used in stand-alone mode to drive an analog RGB LED strip with pre-programmed color changes, but he wants to cascade his color changes down the strips, hence the requirement for individually addressable LEDs. I donât know if a BlinkM can be used to send cascading color changes down a digital RGB LED strip or whether an Arduino is necessary. Iâm also not sure whether an Arduino can be programmed to start color cycling the LED strips immediately on power up. He wants it to start cycling as soon as he turns it on without having to do any preliminary settings. An arduino will start running whatever code you've loaded on it on powerup. If cost is a concern, i'd abandon blinkm as fast as possible and just hook up some ws2801 or lpd8806 light strips to an arduino. Both chips have well documented example arduino code. I wish the pins were labeled correctly, then I could use this in my real projects. I ordered twelve of these for our PORPOISE Robotics program in the schools and have started working with 5 of them. 3 are working fine but 2 suddenly stopped working. They don't get recognized by the Arduino IDE. The yellow LED at 13 goes on but there is no way to upload even the blink program. The back of one of them gets very hot, and the back of the other gets medium hot. It doesn't seem to be the IC chip because we swapped out one to test it with a good one. Anybody else having these problems? Has me very concerned. Ideas? Did you ever figure out why this happened or how to fix the problem? Two of mine just did the same thing. very strange. contact techsupport@sparkfun.com and they can help you out. Can anyone tell me the transfer data rate i can expect from a well developed aplication with UNO R3? Lets say i have a camera sending stream video to arduino, and arduino sending this data to a notebook/desktop all via usb cables or faster interfaces, even 11mbps wifi like DIY HYDROGEN. Can I expect at least 10mbps? Or its just stupid try to connect a webcam directly to arduino, instead of directly connect it to the notebook/desktop, and the desktop aplication control the webcam via whathever input data on arduino? Serial data rates typically top out at 115200 bps, which isn't fast enough for video. You might be able to do more with the other interfaces, but nothing in Arduino is designed for high-bandwidth processing (starting with the difficulty of connecting your camera to the Arduino's USB port in host-mode). You'll likely have better results connecting the camera directly to the PC, and having the Arduino handle your low-bandwidth sensors, UI controls, etc. Would it be possible to setup serial communications between this board and a PC? Sure! The ATmega's serial port goes through the USB connection, so it's trivially easy to send data to and from a PC. Can this Arduino be used for ISP programming? If so how? Can this version be used to program a surface mount atmega328_AU, it seems the UNO R2 can not.. Hi!! I was very excited to buy an Arduino R3 board on Sparkfun (I also bought a cellular shield SM5100). They arrived yesterday!! I followed the arduino website instructions: I downloaded the IDE software; when I plugue the arduino board on my pc (windowns vista), the green led turns on and the ambar led blinks. Untill here, it is all right but it does not work. The arduino uno port instalation returned an error "code 10". I tried to reinstall the driver but the same error occurs. When I open IDE software, in "tool", the option "serial port" is unable to click. I chaged to other computer (also windows vista), changed the usb cable, I disabled my antivirus (norton), I followed the instructions of http://forums.adafruit.com/viewtopic.php?f=21&t=19931 and it does not work. I need help, plaese!! Thanks!!! Wanted add the UNO R3 version matches with the R3 shield in awesome form. It finally does not rub the USB connector! The pins are much longer than most shields I have used in the past and it finally looks like the shields were designed to fit. The only problem I ran into was on the digital side, the extra pins are so close to the mounting hole that I was unable to use it with the size bolts that I normally use for my projects. So this revision can still be used as an ISP to put code onto the 18 "Arduino Pro Mini 328 - 5V/16MHz" and the "atTiny" series chips? I have not tried my UNO R3 as an ISP for the ATtiny85, but I tried one of my R1 UNO with the recent version of the Arduino software(Windows) - 1.0. It will not compile. I am positive the library only needs a simple update, but it was easier to use an older version of the software at the time. I would think the R3 will work just fine with the required capacitor as there are no changes to the board related. Keep your copy of 22 or the short lived 23 version of the Arduino software around if you don't want to update the library. FYI - The drivers for the R3 come with the Arduino software version 1.0. Does this version ship with the snazzy little folded box, hacker stickers and rubber feet or is it just tossed in a antistatic bag? Also, on Addafruit it says the board comes fully assembled. Isn't that how the Arduino Uno, has always come? What is the purpose of the new I2C pins? According to the schematic, they are the same node as the original I2C pins. Is there a planned branch in the hardware where the A4 and A5 pins will no longer support I2C? Also, does anyone know of any example code for the keyboard emulation using the 16U2? On the mega, the I2C pins have always been in a different place than on the uno; this revision will make it so they're in the same spot. With the addition of this, will SFE be carrying 10 pin stackable headers? New header pins? Really? Maybe if future shields are going to be incompatible, someone could just fix the header spacing so that it is the standard 0.1 inches!!! And yes, I did try the "new" header pin format, and it does not work with the old arduino; the pins do interfere with the caps on the arduino. I suppose one could just cut them off, assuming that they are not used -- but why have them if they are not used!? Stupid. Next payday expect my order of one of these beauties! My order has been placed! Woohoo! I cant wait! Come on priority mail! I have the Pololu Baby Orangutan B-328 but it isn't really Arduino sketch friendly(pin mapping and such). Considering how I just started with programming, I think I need an Arduino board. The Baby O. is a great little board but I need some real practice with an actual Arduino, before I go jumping into an AVR Studio 4 programming environment. Thank you SparkFun.com for getting me started on the right foot. P.S. I love the comments. I sit here for hours reading them, sometimes I read them till I fall asleep. Kinda like geeky little bed time stories. Hmm I wonder if they would work for my kids? So with extra pins broken out, why only 14 I/Os still? I'm confused as to what has changed if anything. So, there are only 14 DIO pins (and 6 analog pins) on the chip; the other 8 pins on the chip are gnd, vcc, clock, etc. As far as I can tell the new headers merely replicate some of the existing pins. Looking at the stats of this board versus the Uno you previous sold - the features are identical. So, memory isn't increased after all? This happens to me a lot... I buy something awesome, and the next day the new thing comes out. Welcome to the Apple Effect. Some "Arduino-compatible" boards place other signals in the locations now occupied by the NC and IOREF pins, ranging from +1.8V to analog inputs. Will the release of the R3 break the compatibility of these devices (e.g. the DFRobot Romeo) with future shields? I'd say it's a bit early to say. I think it really depends on if the shield is going to utilize those pins. I don't foresee many using the IOREF but depending on how things go, I think these boards might have adapt those pins if they want to keep up with the community. now that the R3 board and shields are moving to this new "Arduino 1.0" layout will Sparkfun start carrying 10 pin stackable headers or even a 1.0 shield header kit? We are currently waiting on our first order to show up. We expect it any day now and will fill backorders immediately once our shipment arrives. My colleague needed to know the index of refraction of air to umpteen decimals. So I bought an arduino, a barometric pressure sensor, plagiarized some code from Sparkfun (THANKS!) and now he has what he needed. Made a friend along the way. What's not to like about that. I've used Arduino Unos in the past and they have always been a solid little micro-controller for simple projects. I can't say I'm testing the limits of the unit since I only run 20-30 lines of code at a time with my current project but it always does what you tell it to do. Only issue Ive experienced is using the Rx Tx pins while connected to the USB port of the computer can cause the PC to not recognize the board and you need to unplug and reset the board and then the PC will recognize it. All in all, great board for beginners and small projects. I bought this (supposedly) Original Arduino board a few weeks ago and the Arduino IDE shows me that it is not a Certified board. It works fine, but I preferred to buy from SparkFun and not Amazon because I wanted a certified one! Nice open prototyping platform for beginners just getting started with microcontrollers. The pins are labelled on the board & the side of the headers so it's easier to see what pin you're connecting to. I'm currently using this board to run grbl 0.9 for a tabletop CNC design from OpenBuilds & it was really simple to flash & get running. I do recommend anyone purchasing one of these also grab a few spare ATmega 328 chips (https://www.sparkfun.com/products/10524) in case you make a mistake & release the magic smoke. I fell in love with it right when I opened the box. And SparkFun does a really good job on shipping. They shipped just a few hours after I order and it took pnly two days to deliver! I'm impressed! This is my second Arduino Uno. The previous one came with a starter kit and I ordered a wavshield with it so it is dedicated to a specific application that I have in mind. I needed another Arduino Uno to play with so I could learn to develop other applications. This one from sparkfun was available and the note that told me to order the updated IDE was helpful. It works and I've been able to apply sketches from the Arduino Cookbook. I'm having fun and in geek heaven with this Arduino board. Bought it to replace the Arduino Uno on a Parallax Boe-Bot. Works exactly like the original. Plastic shield for the back is a nice addition. Bought it to use as a test mule for my new designs, and have become hooked. Seriously, this thing is more useful than duct tape and WD40. Absolutely amazing, saved some cash from the Arduino website and got a real one, not some cheap knockoff. Thanks sparkfun! Sparkfun should make clear that this is an arduino.org and not arduino.cc board. I'd rather buy a clone from seeed or another company than from the guys that are basically screwing up the arduino brand. Great, but Windows 8 makes it a nightmare. The item itself is perfect. Great functionality and you can use it for anything. Just one warning...You will have to fight many many battles to get any functionality out of this on Windows 8. Even if you go through the ordeal to allow unsigned drivers, install drivers from different compatible technologies, you will not have consistent connectibility. Mac works fantastic. Any other windows, you're set. Just be aware. awesome microcontroller for sous-vide (and beyond)! i need a microcontroller for a home-brew sous-vide and the arduino is a nice and simple core that powered the operation. will definitely use the arduino again for other home projects! I bought an R3 because I had read on arduino.cc that it would not suffer the reset on serial connection problem that other boards have. That does not seem to be the case, this board still resets itself as soon as I connect over the serial interface. Hi, I haven't heard of the R3 not resetting when terminal is opened. Actually from all of my use cases, I have found that it does reset. However, in doing a bit of research on this topic, I found a suggestion that may help you. It appears that if you place a 10μF capacitor between Reset and Ground it will prevent the auto reset permanently. THis board is from the splinter group. Upon plugging it in, I get the popup message : "This board comes from an uncertified manufacturer...." I would like my money to support the original crew. Hi, I'm sorry about this. 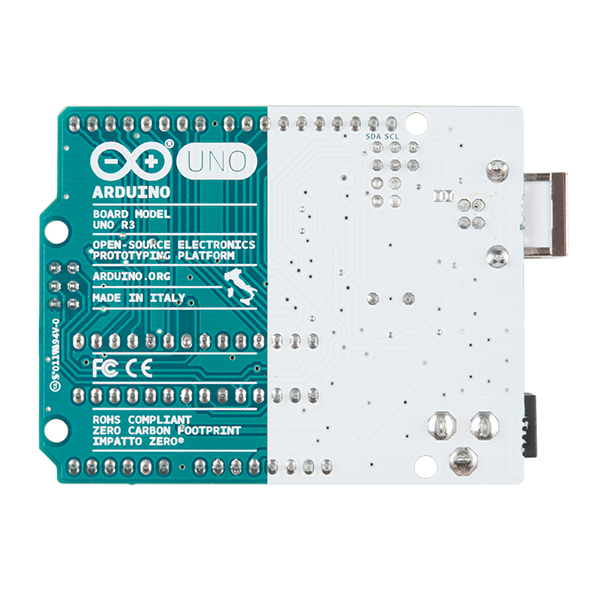 The Uno and other "official" Arduino boards such as the Mega, are not manufactured by the original crew. The error you are seeing is the Arduino.cc crew bringing attention to the fact that your board was made by Arduino SRL. However, at this time, Arduino.cc is not manufacturing a Uno board of their own. We suggest the Arduino Pro and Pro minis from Sparkfun as they do pay a royalty from each item sold back to the Arduino team. Additionally, the RedBoard is a great alternative is you choose to not purchase Unos. Very easy for students to use and lots of useful applications. I used the Arduino board with the Olimex SHIELD-EKG-EMG to create a EMG-EKG sensor unit that can display the output graphically using a laptop running Windows 10. Working perfectly and price is ok , lets order from sparkfun.. The Arduino Uno R3 is a solid microprocessor. There is a complete set of libraries for adding all sorts of inexpensive sensors. The device is fairly rugged. Its easy to program. New to Arduino, and only kinda knew HTML and CSS, but figured code is code. I had this up an running super fast, and figured out how to read a few sensors and control motor speed via PWM on day one! Instantly I started to think of all the things I could do with one of these. The usb port and dc power jack make this very easy to hook up and use. I would highly recommend this board. If your IO ports needs are not excessive (14 digital and 6 analog pins) and your sketch is of medium length (500 lines), the Arduino Uno R3 is perfect. Those limitations are not excessive and in many cases can be extended with simple external circuits. It also has I2C and SCI interfaces for use with many different shields. This is my first venture into electronics. The Arduino has proven to be a very enjoyable learning tool. I look forward to learn about the Arduino and add accessories to the micro controller as I continue. For novices to electronics like myself, I recommend the use of the Arduino. the customer service was great and shipping was fast. Especially considering I ordered 43 UNOs at once! Thanks sparkfun!!! (My 2nd one), smoked the first one,trying to run 4 stepper motors on a 298d & 293d, bread board got kinda full of wires & I plugged the 12 v power into the UNO. corrupted the memory, had to download new IDE (no problem) wonder if it is the atmega 328 on the old one? ?, new one works Great!! Meets or exceeds product description on quality. Works great with no issues out of the box. Highly recommended. It worked great. I am learning a lot. I like the Uno - R3 because I am very familiar with its capabilities. It is a complete microprocessor platform, ready to be put to work. I often use them in non-Arduino projects. I also like the Red Board for the same reasons. Arduino R3 - Great little microcontroller. The title says it all. A great board for the project I am building. Able to learn coding and circuitry quickly without wasted time with non value added details. It's all packaged for efficient learning. Downloading and working with the SMARTGPU2 libraries is a challenging. My initial attraction to the Arduino Uno R3 was that it runs with C/C++, a language Iâm familiar with. So far it, and the Xbee attachments have performed flawlessly, just as the community (hobbyists/engineers) has advertised. Iâm very much enjoying my first project and am already dreaming of others. I find it most satisfying to work with a quality product while having the immense support of the manufacturer and it retailers. Another very much appreciated group I turn to for help and advice are those sharing their experiences over the Internet. Extremely easy to use, very versatile. I run it on Windows 8 and have had absolutely no problems. Arduinos are great for quick set up to control experiments. Even better is Sparkfuns support. Their guides make set up quick, painless, and fun. Keep up the good work Sparkfun! The best prototyping board ! Amazing technology. I built my first computer IBM AT 10 megahertz . Telling you my age, the credit card size at 16 megahertz. I'm learning a lot about electronics, my background is Mechnical engineering. I highly recommend this open source and generous people supporting the Arduino uno. It's a great microcontroller ! The pin printout on the side I needed for the longest time, and its a nice machine that treats my old computer as if it was new, and It took my sketches without stress! I am a neardy Dad and my kids like to see Arduino in action. Thank you for the Sale also! This is less powerful than a Raspberry pie, but is very simple and straight forward. The documentation and forum sites easily answer any questions that you might have when starting out. The example sketches (programs, for those who haven't started with Arduino yet), are a great learning tool and you'll have a sketch of your own up and running in minute or hours instead of days. My only complaint is that you are limited to the number of digital and analog pins, but then you could connect more Arduinos together as a system. I didn't notice that there was only one hardware serial port, so I ended up using a Leonardo. After many hours struggling with two new Leonardos I decided that their bootloader was faulty and flashed both using the Uno as ICSP, which worked perfectly. If one hardware serial port is not a problem for your application, the Uno is a good choice. It's great for starters who are beginning to using Arduino broads and anyone interested in doing electrical projects. After opening the box there was a 3m Bumpon strip that looked hotglued to the board is over the UNO writing and I believe one of the resistors. This is my first Arduino from Sparkfun and I'm very disappointed. Why smear hotglue all over the top of the board. I haven't. Checked if it runs fine but to be honest I like to use clear cases and display my arduinos in projects. Hmmm, that's odd. It sounds like a manufacturing plant issue. Please contact our tech support team, and they can assist you in getting a replacement or refund. Arduino Uno is fun like SparkFun! There's so much community support and sample code out there. I was able to get up and running quickly. This is a huge amount of fun! It's an Uno, what else is there to say other than buying it from one of my favorite sites, SparkFun! Great Stuff! I teach a Maker class. Since most popular textbooks show Arduino Uno, I wanted to use that format. However, I had to make sure that students dowloaded IDE from Arduino.org and not from Arduino.cc in order to match up the drivers for the Arduino SRL boards. If Arduino.cc IDE was already installed, I needed to uninstall it from student's computer. Fortunately, all Sketch software ran on the IDE from both sources. Sketch files were not deleted when I uninstalled Arduino.cc IDE. Glad Sparkfun still carries Arduino UNO but might want to document the download path better. The "Arduino.org" sticker attached to the processor chip was helpful in differentiating different boards (SRL vs. Original boards), so I left it attached. User friendly with abundant usable information,examples and a good library. Students are obtaining skills in electronics and programming in C++ as well. Currently I use the Arduino Uno in tester type designs used in testing other equipment. I use the pulse width modulator capability to create digital to analog signals with just a few added small components. I also use the analog to digital functions for analog signal measurement of course. I do add of course filters to those circuits. I also use it to detect a voltage off of a pot element that I use as a selector switch. The only issue I have with the A/D function is that there are just not enough bits of resolution. But then again, what do you expect from a board that only cost you $25.00. For what it gives you, it is a bargain. The only real issue I have with the hardware is that there is no direct connection to the output of the power input barrel connector. Sure, you can pick off the power in at Pin 8 on the power connector, but then you have to deal with a diode drop and a limit on the current. I just wish "PWRIN" popped out on one of the connectors some place. Other than that, the board design is very flexible and seems to work reliably. The Arduino Uno really shines when you add external circuits to it to drive your projects electronics. They give you Eagle Files in both schematic and layout. This makes it easy to design other hardware around your project. Currently, I use Altium as my design package. I have though exported the layout to a DXF file and use that to put an Arduino "component" on my printed Circuit assemblies. Then I just plug the Arduino Uno onto my design. The software design environment is easy to use and has features (such as the tabs) that can be used to organize your software and make things tidy. The Arduino software though can be buggy at times. For example, you cannot double click on your project file and have the software compile. You need to open Arduino first, then open you project. If you don't do this, you'll get all kinds of weird errors. Once you get past things like this though, the environment is easy to manipulate. There are a ton of libraries and examples to get you started on your project. Most importantly though, the development environment is free! So, again, the cost of the environment is just right. I have enjoyed and have had a lot of fun with the design. Does it have its limits? Sure. The hardware design though is flexible and the cost to build your projects is very low. Uno - R3 works great, starting to learn the code. (Sketches) Have used Basic before so I have to learn the new codes and protocol of sketching for Arduino. THANKS!!! Nice, compact little board but a lot of RFI from it ... hard to imagine how it passed FCC/CE. This is no big deal in most applications but it turned out this board has a strong spur sitting right on1.5742 GHz (the GS L1 frequency). I could not get the 13750 GPS Logger Shield to work with it. Noise is so bad the GPS3906-TLP chip on the shield could not get a fix under any conditions. Proof was: a) hold the Uno in RESET with the on-board button and the GPS comes right up, b) same GPS shield works perfectly with MEGA2560 and finally c) I measured relative emissions of Uno R3 and MEGA2560 (night and day) and sent data to SF Tech Support. Eventually ordered 4 MEGA2560's and GPS projects all got done without further issues. It is an Arduino.... what more is there to say! As the title suggests, it works fine! As an aside, kudos to Sparkfun for providing outstanding customer support for a newbie like me. They were quick and helpful in answering my questions. There are fancier Arduino's such as the DUE but for straightforward shields this is a good choice. Mine has been rock solid. I do have to laugh at the USB jack! It's easy to program this. So. Yeah. I don't really know what else to say. I guess I could talk about cons, which are few, mind you. The solders on the back of the board can be annoying, I wish it was through hole soldered, but there's the redboard for that. I bought this one because that's what was recommended in the pro's product page. We used the Arduino Uno flashed with firmware so it detects as a USB HID device, an XBee kit, and a Raspberry Pi to adapt a USB 2d barcode scanner so that it operates wirelessly and supports scan history and playback, all transparent to the host machine. These platforms make it easier than ever to do difficult things with only a small investment of time and resources. What an amazing time to be alive. Great Fun. Easy to program. This is a must have item for the electronic nerd. Hours of intellectual stimulation. A great creative addition to breadboard circuits. I was able to successfully prototype what I wanted pretty easy. The one hiccup is that it would have been better to know I had to buy the USB data cable and power adapter myself before receiving the device to hit the ground more immediately. it is delivered in a very good state. You might find cheaper ones elsewhere but this is an extremely well made product and gives you a nice feeling. works very well no problems at all . I love this thing. I been playing with the Arduino Uno for several years now. The support is incredible, the software easy to use. If you can imagine it you can probably make this thing do it. One new addition I found with this particular unit was the addition of the plastic bottom. With the exposed solder joints on the bottom of the card there is always a chance of shorting something out if you set it on a metal surface. Now there is no worries. It also provides with a couple extra mounting holes. I highly recommend this card, the price is low, it's powerful and well supported! I would recommend Sparkfun team to add a note which says that this product does not come with the cable. Does everything I need plus more. Very reliable! Arduino has ben implemented in some projects I made, allways with success. I suggest using it every time I can. For the moment this one I got from Sparkfun is used as possible backup fot he poject I am working at. It is my first time with any kind of Arduino and so far I am really happy and satisfied with it. I have tons to learn and every time I start to work with the Arduino I love. Unlike my other Uno - R3, this one came with a small carrier, some additional pins and the GPIO had the pins clearly marked on the side. All for the same price as the old board. Amazing how much an Arduino can do. Although I use the Arduino Uno - R3s for other things, my main use is running GRBL on them to control a low power laser engraver (2.5 to 7w). It is absolutely amazing how much this little board can do. In this case it is controlling three stepper motors (coordinating all three simultaneously as is needed) while doing the PWM for the laser and while doing spindle control. Thus far I've built a handful of these machines and have used the Uno in all of them without a hitch. The machines are fed gcode commands through the serial port from either a pc or RPi. Has met my expectations and it's fun to experiment with. My recent purchase of an Arduino Uno has met my expectations so far. It's been a good learning tool and fun to experiment with. I use both Windows 7 and Ubuntu Linux versions of the IDE, and I prefer using C syntax for programming as I'm more experienced with it. I also have a Raspberry Pi 3B but for most of my projects, simple robotics and environmental sensing, the Uno works quite well. I don't have many add-ons at the moment, but I'll be expanding on them soon. I intend to buy a few more advanced Arduinos in the near future as well. My experience with sparkfun has been positive and I look forward to doing more business with them. Arrived in quick time and works as expected. The only surprise was the USB-B type connector. That's not a Sparkfun issue, but merely an Arduino thing that caught me off guard. Overall it's working great and doing everything I need! I'm heavily into Arduino. I keep different shields mounted. Thus, I need multiple R3s. This arduino board was able to perform all the functions needed! It was exactly how the description said and matched all of the necessary requirements! Good for small projects , for example with LEDs. A little complicated at first, but then it is very easy to use. Good product. Iâm brand new to coding and Iâve already managed to make some really fun projects. Awesome. So accessible. I used the Arduino to program and control a stepper motor. Is working great. Works well, no issues. Good price, too. Thanks sparkfun! Great little board that could? Best thing you can buy as an entry level for beginners. A lot of support and very easy to use. Cross platform IDE and very helpful forum. A very vast range of third party parts that fit perfectly. Couldn't buy a better product even if I wanted! Very satisfied. If you haven't bought one yet or you are still undecided, wait no more, just buy it. I promise you that you won't regret it and you'll find a lot of tutorials if you have no idea what to do with it. Because my project progressed so fast and smoothly my partner wanted to implement it immediately! Works great. I'll be ordering more boards in the future. This product is great; it is just about what I expected. I use it in conjunction with my raspberry pi to hook up lights, buttons, motors , etc. Only complaint I have is it does not come with the USB to hook it up. It is a standard printer cable. These things are great for little projects. I popped one of the Breadboard shields on it, and with one TMP36 and 3 wires (and a little programming) I was sending temperatures to my Computer through the USB cable. And I know many people have done much more complicated projects. Bought two and gave one to a 15 year old young lady who has taken off in her programming. I enjoy teaching young people and watching them excel. Both the units worked perfectly. I was able to make useable things for around the house. I am a computer teacher and I use this board in my class, I love it. Great little board that does. This is the non-SMD Arduino Uno - R3 board. Exactly what I wanted ... at a good sale price. Should have purchased ten more as same does everything that I expected it to. Since it is open source. it is easy to program. Also, the board has a nice design. Till now, it is working great for me. Thanks Sparkfun! Arduino IDE said it wasn't certified but I'm happy with it. Upon connecting it to my computer, every single time it used to say that it was not a certified board. Other than that I had no issues. The Uno and other “official” Arduino boards such as the Mega, are not manufactured by the original crew. The error you are seeing is the Arduino.cc crew bringing attention to the fact that your board was made by Arduino SRL. However, at this time, Arduino.cc is not manufacturing a Uno board of their own. We suggest the Arduino Pro and Pro minis from Sparkfun as they do pay a royalty from each item sold back to the Arduino team. Additionally, the RedBoard is a great alternative is you choose to not purchase Unos. Still new to it. But its amazing.